***UPDATE: WordPress has announced this new editor will be released on Thursday, December 6th. Of course, in the past they have changed the date, but its never too early to be prepared since this change will happen at some point in the near future! **Edit: The same day I originally posted this, the people at WordPress moved the release date out to January. This means you have extra time to install Classice Editor and/or learn Gutenberg! Have you heard in the past several months about Gutenberg? 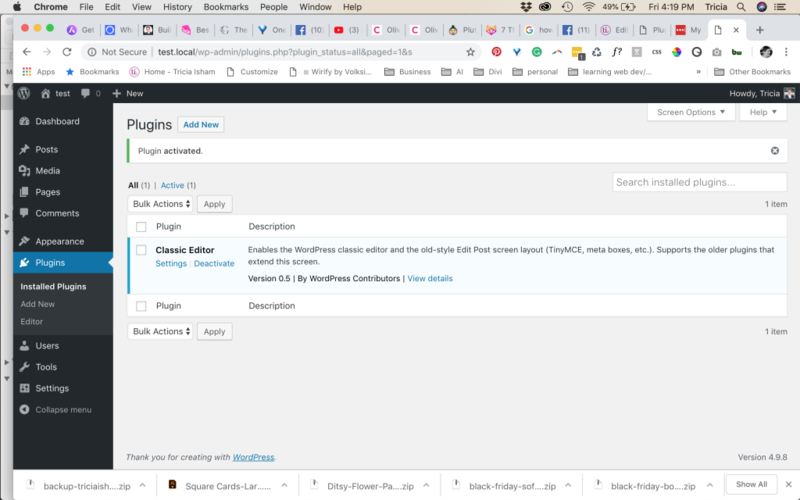 Its the new editor for WordPress being released on Tuesday, November 27th as WordPress 5.0. Since this is a major change to WordPress, and therefore to the code base for your site, there will be a few things to do on your WordPress site to prepare for this update if you already have a website. Don’t worry, you won’t have to touch any code! As with any major update to the WordPress core, you’ll want to make sure you have a backup of your site. You should have a backup plugin that does this for you (or possibly your host creates a backup for you). If you have a backup plugin, its usually a matter of finding that plugin listed on the black bar of your dashboard, clicking that and finding a button that says backup. If it gives you an opportunity to download it, then do that! I use BackupBuddy, and have used Updraft Plus in the past. It’s good practice to make regular backups of your website anyway, but especially before a major update. Many plugin creators have anticipated the release of this Gutenberg Editor and have taken steps to continue working properly after its been installed, but there are many others that haven’t quite gotten theirs ready. Installing the Classic Editor should retain your websites’ look and functions. You may also notice plugins needing to be updated, and if you’ve backed up your site, its a good idea to update these while you’re in there! It’s always a good idea to hold off on making updates to your site for a few days when there’s a major update to WordPress. There are always kinks and bugs to work out, so wait for others to discover them so they can be fixed. Before making the update in a few weeks first do a few minutes of research to see if there are any problems reported as a result. Even if you don’t do any of the others, at least do this. Install and activate the Classic Editor. If you haven’t already clicked to dismiss this box, you’ll find it under the heading Not Quite Ready. This will make sure Gutenberg does not get installed automatically or get activated on accident. Activating this will help your site maintain its look and functions as it works today, and allow you to activate the Gutenberg editor when you are ready in the future. Go ahead and click on the white “Install the Classic Editor button.” And then click Activate when prompted. 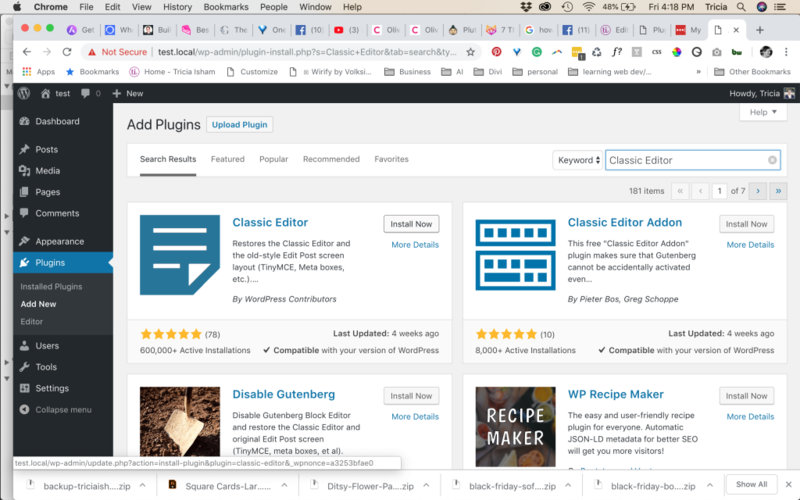 Want to install the Classic Editor if you don’t have a developer in your back pocket, but are familiar enough with WordPress to create their own blog posts? When you return to the Plugins page, scroll down the list of plugins and you should see Classic Editor with the words Settings and Deactivate underneath. Now Classic Editor is installed and you don’t have to worry about Gutenberg being activated on your site until you want to activate it. How do I work with Gutenberg? We’ll talk about how to work with Gutenberg in a future post so don’t worry about trying to learn it all on your own through endless Googling and frustration. 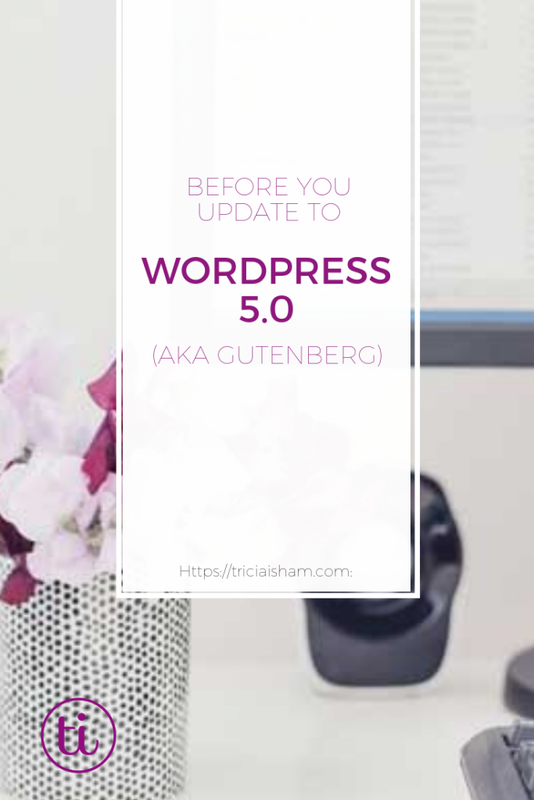 I just wanted to take the time to help you update your site in preparation for this WordPress 5.0 update to help you avoid possible frustration this coming week. 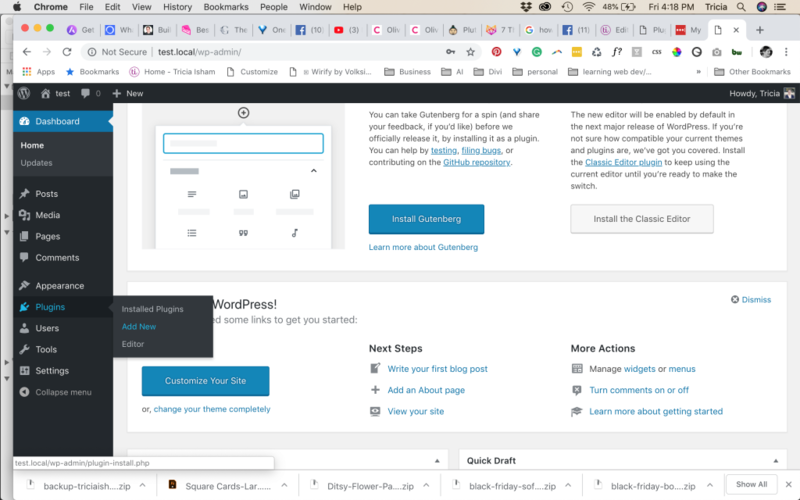 If you’re familiar with creating your own blog posts and want to play with Gutenberg, you can head over to WordPress.org sample editor. What if I don’t have a developer and don’t want to do this by myself? Not sure how to make backups of your site, or don’t do it regularly? Let’s see what we can do to get your site safe and secure today with an Essentials Maintenance Package. Hi! 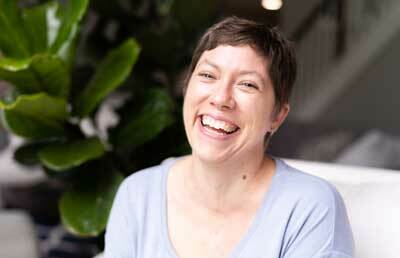 I’m Tricia, and I help solopreneurs get their websites launched so they can share their passion with the world. How is a Blog Different than a Website? Or is it?